Duration: Inserting and synchronizing the song text syllables to melody notes takes approximately 30 minutes for a 3 minutes song. use menu File/open to load a standard MIDI file. 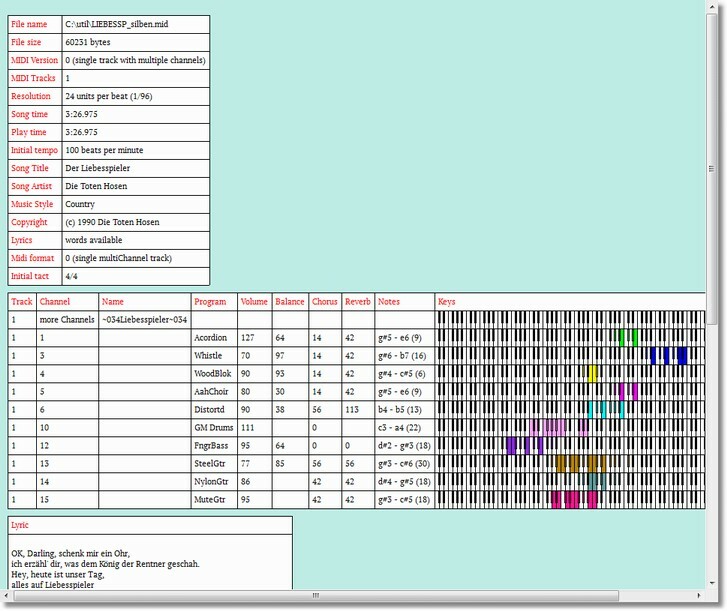 GNMIDI will display information about the MIDI song in a new window. Start playing the song using space key and listen to the melody sound. Compare the sound with the channel sounds in the information window. To make sure that it is the right channel use GNMIDI operation mute voices in menu Modify/sound operations and remove all other channels than the probable melody channel. Play the temporary resulting song and verify if it really plays only the melody. For unclear situations use the mute voices operation to mute some channels till you know which channel contains the melody notes. If the song already contains lyrics in a known lyrics format they will be displayed. use menu Modify/Karaoke editor. First a dialog will appear that asks for the melody channel number. If the song already contains lyrics that you don't want to use (e.g. wrong language) then check the radio button delete existing lyrics. If the song has no lyrics (e.g. instrumental) but still want synchronized karaoke syllables you could check the radio button add note names to lyrics. Press OK to continue with entering lyrics. The lyrics dialog appears if the song does not contain lyrics or if the option delete existing lyrics has been used in previous dialog. 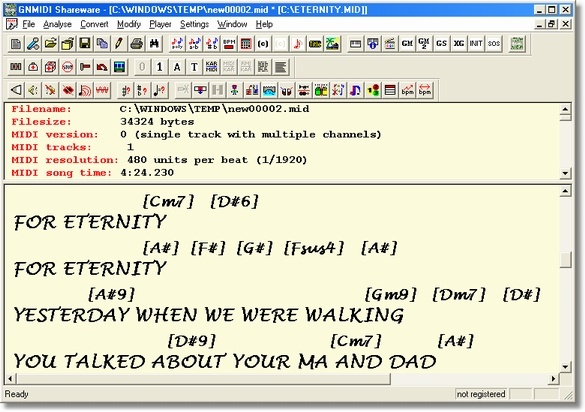 Copy the lyrics text into the dialog edit box (use right mouse popup menu operations copy and paste or use Ctrl+C or Ctrl+V keys) or enter the text manually. The lines and words will be later split into syllables. Press OK when the lyrics are ready. lock: the lock symbol can be toggled by clicking into this column of the wanted row. The lock symbol helps to prevent moving syllables that are already synchronized. It is recommended to lock the last syllable of a synchronized song text line. synchronization position: this column shows the bar position of the melody note and is readonly. text: contains the line or word or syllable that is currently synchronized to the note in same row. note: contains a melody note with certain note name. The yellow bar width refers to the note duration. The horizontal yellow bar position refers to the note height. First unlock rows that protect unwanted splitting (click into key symbol column if the lock symbol is shown in next lines). This is ok because the rows after this text line are not yet synchronized and the lock is not necessary. Click into the column of a text line that needs to be split into syllables. Use the right and left arrow keys to position the cursor to a word position that should be split. Press key F7 to split the text at this position. The text behind the cursor will be moved into next line and the following rows text also moved down. If there would be still a lock symbol in one of these rows then this moving would be prevented. Use key F8 for the case that the splitting was wrong and the parts should be merged again. Don't remove the spaces after the end of words. Split only the next line into syllables and then synchronize these syllables and protect them by locking the last synchronized syllable. Play the part of the song that is currently visible in this table using play button. Try to remember which syllable belongs to which note. Click into a text row that should be moved and use the keys F5 (up) and F6 (down) to move the text to the above or next row including the following text rows. A lock symbol in one of these rows will protect from moving text unwanted. Use OK button if you want to keep the synchronized data. GNMIDI will open a new window for the modified song. The file data is currently in temporary folder. Use menu File/Save As to save the result file to a new file. At the syllable at end of each line you should append a paragraph or a line break. A paragraph break is used between two verses and a line break is used for lines inside a verse. Sometimes the melody was not played exactly as the song has been sung by a certain recording. It might be that there are missing notes in the song. 11. Repeat the steps 7-10 till the whole song is synchronized. The GNMIDI demo only allows to synchronize the first half of the song. Please order a GNMIDI license to be able to synchronize whole song. Use Cancel button if you don't want to save the synchronized data. 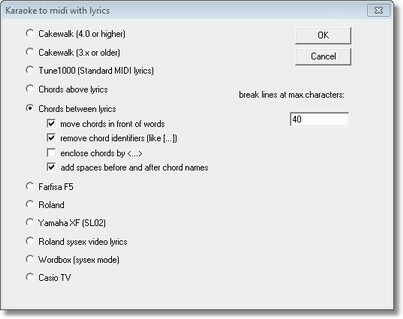 The synchronization editor uses standard MIDI lyrics format for embedding the synchronized lyrics. GNMIDI can convert to .kar format or to other popular lyrics formats. Use menu file open to load the MIDI file or .kar file or .mp3 song. The song text will be displayed if it is already embedded. Use space key or menu Player functions to start playing the song. Synchronized song text will be colored live. Embedded chords will be displayed in a chords line above the lyrics.